It comes as a shock to me, but not everyone wants their house looking like a toyshop just exploded in there! Some people have been there, done that, bought several T-shirts and are now ready for their white tablecloths, cream sofas and uncluttered house. Not me of course, I am destined to have years of colour and mess as I share the house with two under twos from early next year. My mum and dad however fall into the second category. All their children have grown up and left home(ish) and they are enjoying the peace. Their peace is interrupted every Thursday when they get a visit from my little monster as I go off to work for the day and the little corner of the living room reserved for baby bits is growing at a speedy rate. They shouldn't have to compromise every room though and when we were offered the Cosatto Slim Jim highchair I knew they would love it. small though that it is barely noticeable, yet popped out it is a full size and quality high chair suitable for the little dude to devour his fishfingers in. The highchair comes in Cosatto's customary colourful designs and ours features ice lollies on an orange frame (popsicle). The seat has a five point harness and large tray for as well as a high backrest. I was so shocked when the package arrived and thought there would be loads of fiddly bits to put together as it was so small but the high chair comes ready made. All you do is pull the handle to open it up, and the same handle to close it. The only thing I would really change about the highchair is the fact there is no bar between their legs meaning they do need to be strapped in. As I know Dylan can't escape yet and we do not leave him unattended in there, I am used to just plonking him in. This is no issue for my mum and dad though as they like to strap him in properly anyway. We are really impressed with the Cosatto Slim Jim highchair. It would be perfect for travelling with if you were going camping/caravanning or even for day trips as it folds so compact it would easily fit in most car boots. We have resigned ourselves to the highchair being a permanant fixture in our dining room but for Grandma and Grandpa it is the perfect solution. Priced at £70 it is good value for the convenience and the covers and straps are completely removable so it is so easy to keep clean. It also comes with a 4 year guarantee! 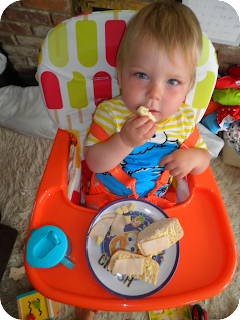 Disclaimer: I was provided with the Cosatto Slim Jim highchair for the purpose of this review but all thoughts, opinions and photos are my own.